Joshua White, Rob Thorsen and Duncan Moore (from left) at Dizzy's on Friday, Oct. 28. San Diego piano virtuoso Joshua White took advantage of his week off from touring with award-winning saxophonist Rudresh Mahanthappa to examine the music of Bill Evans. 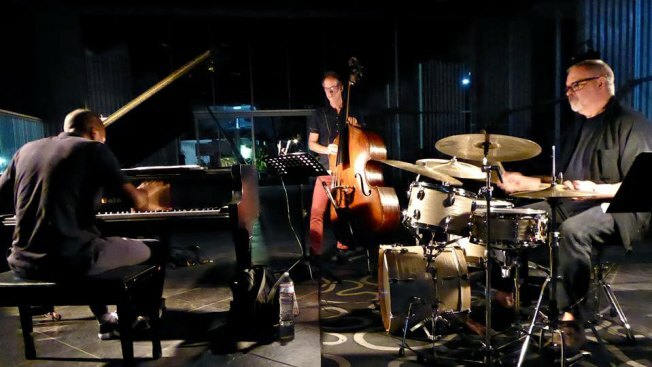 His trio, featuring bassist Rob Thorsen and drummer Duncan Moore, played in front of a large and enthusiastic audience at Dizzy’s in Pacific Beach on Oct. 28. At first glance, White and Evans don’t necessarily seem like a natural fit. Evans, who died in 1980 at the age of 51 often came off as delicate and introspective, but each man has a sorcerer’s command of harmony and a singular melodic vocabulary. White began the evening alone, pounding splintered repetitions into the brisk fall air to introduce the appropriately titled “Displacement,” facilitated by the measured viscosity of Moore’s cymbals and the sinewy pulse of Thorsen’s quarter notes. Things got pretty “out-there” with the trio exploration of “12 Tone Tune,” where the pointillistic theme served as a launching pad into the unknown, but the pianist’s ability to translate even the most abstract logic into glorious swing was never in doubt. White tossed his hands in the air while looking in Thorsen’s direction, as if to say, “It’s all you, man,” in the silence between selections. The bassist responded with the eerie cry of ponticello bowing seguing into a muscular pizzicato on “Very Early,” where the space between each pulse felt wide enough to drive a truck through -- especially on the feathery glide of Moore’s brushes. Moore’s detailed ride cymbal pings inspired an “all-in” aesthetic on “Funkallero,” where the kinetic energy in the room spiraled into ecstatic orbits, but he dialed the intensity down during his drum solo, using short snare drum cadences to illustrate an increasingly complex and explosive narrative. White’s long, powerful fingers appeared to ignite like Tesla coils on “Loose Blues,” shooting streams of melodies that careened wildly from the cathedral to slaughterhouse and back, and those radiant pulses carried straight into “Time Remembered,” which evoked Ran Blake or Horace Tapscott more than Evans. Above all, White’s exploratory prowess seemed to be guided by a supreme intuitive flow, drawing the input of his cohorts into a laser-like focus. The evening concluded with one of Evans’ most popular pieces, “Waltz for Debbie,” which White interpreted in the spirit of the composer -- full of dashing, baroque flourishes and leaving plenty of room for a Thorsen essay of limber acuity. It was another wonderful night of pure music brought to us by Chuck Perrin, the sole proprietor of Dizzy’s. It is with much sadness that I must report that Perrin will soon be looking for a new home. The property at San Diego Jet Ski Rentals that Perrin has been using as a venue has been sold, and he will soon be hosting his concerts at the Musicians Union on Morena Boulevard until he can find a permanent location.